The Rockets were one of the leagues best offenses as the fast paced Mike D’Antoni coached offense specialized in shooting threes. The Rockets offense was driven by either shots in the paint of a three point shot. Any mid range jumper was considered rare for the unit last season. James Harden became the team’s point guard becoming the primary ball handler. Harden finished as the runner up in the MVP voting with a stat line of 29.1 points, 11.2 assists and 8.1 rebounds. Scary part is he is still getting better and the Rockets went out this off season and got him help. The Rockets came out as a surprised contended to land Chris Paul in a trade. They traded mostly bench assets and a future first round pick. Questions surround if Chris Paul and James Harden can co-exist and share the ball effectively since they dominate the ball so much. However, each is a willing passer and selfless teammate so anytime you have the opportunity to acquire a future hall of famer still in his prime, any team would make that move. Chris Paul is still a top three point guard in the league, if not the best. Paul is good for about 18 points and 9-10 assists on any given night while providing terrific defense. Paul is a highly efficient scorer and differs to get his teammates to get them involved in the game. If anyone wants to learn how to run the point guard position the correct way just watch a highlight tape of Paul. James Harden will slide back to his natural 2 guard position with Paul on the roster although Harden looked terrific as a point guard last season. Harden is coming off a runner up in the MVP voting a year ago and is now the NBA’s highest paid player. Harden signed a 6 year $228 million extension. Trevor Ariza is a prototypical three and D wing in today’s NBA. His 6’8 frame allows him to close out on shooters effectively and disrupt passing lanes. Arzia is a career 35.1% three point shooter. His is extremely durable for the Rockets as well only missing three games over the past three seasons. Ryan Anderson is a solid stretch four good for Houston’s offense but a liability on defense. His rebounding is below avergae as well only pulling in 4.6 rebounds a game a year ago. He is a knockdown shooter hitting 40.4% of his three point attempts last season. Clint Capela showed significant growth in his third year. Capela is an athletic center and good rim protector evident by his 1.2 blocks per game. Capela became an offensive threat as well increasing his scoring average from 7.0 points to 12.4 points per game. Most importantly his free throw shooting improved from 37.9% to 53.5% which will prevent intentionally fouling him to send him to the line. The depth in the back court is not the Rockets strength. It should factor too heavily on them unless Chris Paul suffers an injury. James Harden plays a ton of minutes nightly and will be the primary ball handler when Paul is sitting. Bobby Brown, Tim Quarterman and Isaiah Taylor all have limited experience in the NBA. Brown is the veteran of the group having spent the past 6 seasons overseas in Europe before finally making his way back state side to join the Rockets last season. Don’t expect the Rockets to count on either of these guys too much. 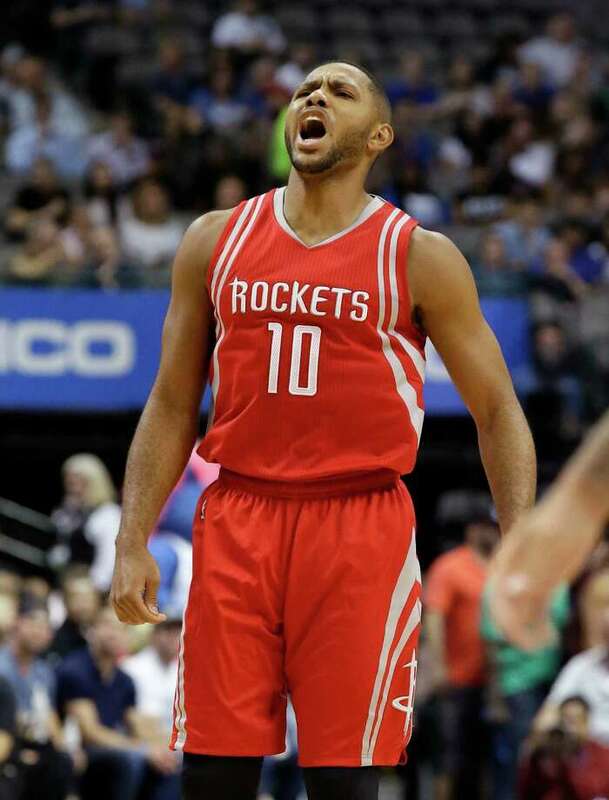 Eric Gordon is coming off a healthy year which he was just awarded the NBA’s sixth man of the year award. It was good to see Gordon be recognized for a major reward after an injury riddled career. Gordon played in 75 games (15 starts) and averaged 31 minutes per game. Gordon scored 16.2 points per game on 37.4% shooting from three. P.J Tucker signed a 4 year $32 million deal with Houston when free agency began. Tucker is a defense first player capable of knocking down a couple of three on offense. He’ll bring toughness to the unit and will play minutes down the stretch to close out games. Luc Mbah a Moute is another strong defensive player but has a very limited offensive game. His role will be strictly defense. Mbah a Moute has the capability to defend multiple positions which will make him a strong asset to Houston. Cam Oliver surprisingly went undrafted out of Nevada. Oliver was highly effective at Nevada playing in 35 games to average 16.0 points, 8.7 rebounds, 2.6 blocks and 1.8 assists per game. He was the MWC defensive player of the year as well. He has a shot of being an undrafted free agent steal for the Rockets. Tarik Black will man the back up four spot. He brings a drastic different style of play than Anderson. Black rejoins the Rockets for his second stint. He’s a solid rebounder off the bench and plays good defense. Isaiah Hartenstein is an intriguing prospect drafted in the second round. He’s a do it all forward capable of stepping out beyond the arc and using his athleticism to get to the rim. Hartenstein is 7′ foot tall and is a solid passer for his size. Nene played effective minutes off the bench as the back up center for the Rockets last season. In 17.9 minutes of game action he scored 9.1 points a game on 61.7% shooting. Nene was highly effective in his reserved role. Zhou Qi is an intriguing prospect that is coming over from China for this season. Qi has been apart of the Chinese National teams in the past and has a unique skill set for a guy who is 7’1. He led the CBA in blocked shots each of the past two seasons. The Houston Rockets are primed to be a top three team in the Western Conference this season. They are in much better position to challenge the Warriors with the addition of Chris Paul. Paul and Harden is the best back court in the NBA heading into next season and both are determined to reach the conference finals this year. The Rockets are still interested in acquiring Carmelo Anthony and are the front runners to land him if Anthony agrees to a trade. Adding Anthony will add a whole different dynamic to the team. The Rockets may be looking at a 60 plus win season regardless. This offense is poised to shatter more franchise records along the way. Next Post: Where will Mitchell Robinson end up?